What if there was no such thing as ko? It occurred to me the other day when I was pondering whether or not extra-terrestrials would play go as we know it. Is the ko rule, that you are not allowed to re-capture immediately, really the most obvious? If we were inventing go today, would we be happy with a rule that allowed arbitrarily distant areas of the board to effect local situations? I'm not sure. But I have an idea for an alternative: when you capture a ko for the first time (i.e. when your opponent would normally make their first ko threat), you have to play a second stone, as part of the same turn, to fill in the ko. This means that you play two stones as your turn when you would normally be starting a ko. Now, who's ready for an ongoing game, to try it out? Bildstein: Thanks for your feedback :) It may be slightly more arbitrary than not allowing repitition, but I still think it's an interesting idea. The more I think about it, the more I think it would actually work. But instead of the broad spectrum of outcomes in life-and-death situations, we would have far fewer, because all the ko situations would be reduced to simple life or death. QWerner: Jes I think this rule will kame something simle. But I think the ko-rule is not only to avouid cycles, because with two ko`s there will be a cycles. May be t hase also something to do wich conection, which is dependent from the goban (eg. on a goban witch is built with hexagons, the stones have only one kind of contact. No way to cut a chains. (Which will gain a boring game ofcourse:o)) So may be the ko'rule is a rule which organise cuts and conecions localy, but throught the complex game we gain longrange influence. Bildstein: Here's another quick idea, that doesn't involve playing two stones in one turn: kos can not be recaptured ever, without capturing at least one other stone. I.e. a ko is an eye. Unfortunately, this would mean than instead of double ko to capture a group outright, you'd end up with unconditional life. Gorobei: This still strikes me as a hack. If we want to make the rule set as simple as possible (to maximize our chances of playing the same game as the alien race,) then just ignore ko -- let the players retake endlessly, or until they mutually declare a draw. Bildstein: (Thanks for the feedback - it's always appreciated.) So if we do that, we're effectively saying that all kos cause a draw. The only time people would keep playing the ko (i.e. agree to a draw) is if for either player giving up the ko would cost the game. I think that's a workable idea. Tas: Here´s another one... You may not play in a way that makes a group of yours have no liberties - ever. Meaning that one eye is sufficient for life. It would make the game quite much simpler. (Sebastian:) That's One-Eyed Go. As for the original idea, it is half of Proselytes Go I.
Slarty: What if moves that result in a capture but have no liberties prior to that were also removed? I'm putting another alternative at GenevaKoRule. Anonymous: What if the game ends when an endless ko appears? Let's assume that a game is being played and a ko appears. To end the ko two moves are required. Thus the other player gets two 'free' moves. 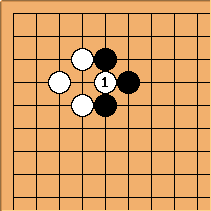 If the value of the two free moves is greater than that of the ko, then the ko is temporarily interrupted, like in normal go. Otherwise, the ko is filled in and ends. 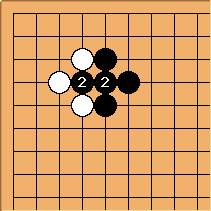 If the ko is, however, the largest point on the board, we can end the game there and treat the local position like a type of seki and evaluate the rest of the board to find a winner.